Patricia Clark. The Canopy. Terrapin Books, 2017. 77 pgs. $16.00. 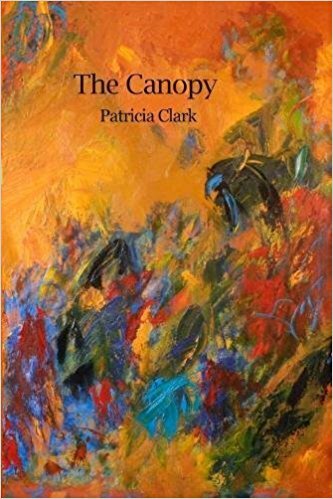 Patricia Clark’s most recent collection, The Canopy, is filled with nature—trees, birds, flowers—and with death—or perhaps not death so much as dying, or perhaps moreso the residue of death and dying. The poems are precise, attentive to the physical world, and poignant. The book’s thematic concerns—how astonishing the fact of life, how profound and yet also how slight the difference between being alive and no longer being alive—are effectively developed because of Clark’s reliance on the concrete. Readers are seduced into appreciating the world as it is and then reminded of how temporarily we inhabit it. The first straightforward line turns on the following phrase, “being alive,” which leads us (or at least led me) to expect a meditation on transcendence, which this poem may in its own way be. The bigger surprise, though, comes after the next line break, “twenty” not a statement about temperature on this “cold January” day but leading instead to “wild turkeys.” Already, Clark has exploited the line break twice to suggest that this poem won’t go where readers expect. Ten of these thirteen lines are devoted to a detailed and lyrical description of these turkeys, each line both magnificently concrete and sonically attractive, even sometimes playful. The speaker earns the reader’s trust because she has been so attentive to her subject—how else to narrate a turkey’s early morning moves: “first unbending out of a hunched ball, then / unfurling a wing, the second, while the broad / tail sticks out, flares, judders up and down.” Rather than an object of ridicule, the turkey becomes almost glorious. The sounds as well as images in these lines draw out attention, first the short “u” in “unbending…hunched…unfurling” and then the series of accented syllables, “broad / tail sticks out, flares.” The spondee here, in the exact center of the poem, insists that we pay attention—and I love that later word, “judders.” In the following lines, the speaker steps back, commenting rather than describing, responding to human interpretations of the world rather than to the world’s opening up at dawn. Before the final question, she returns again to an alliterative image, “the way they balance on brittle thin / branches seemingly without fear.” This line recalls the poem’s title and reveals the lesson humans can learn even from such unlovely birds. “Balance” we’re so often told is desirable, but the more important detail here is that the turkeys claim their comfortable place in the world “without fear.” That’s what the speaker seems to envy, the turkeys’ acceptance of the world’s and their own fragility without any anxious grasping after security. “Balance, January” succeeds because Clark is careful with craft but also because the tone is both respectful and vulnerable. The speaker, we sense, is honest and so trustworthy. books. Memory is the fixative. There she moves. There she stops breathing. The poems in The Canopy are moving and memorable. Clark’s skill with craft means that she can present difficult material effectively, without overwrought angst or false notes along the way. The individual poems are arranged so that the collection’s power is cumulative. It’s a thoughtful collection that will invite its readers toward thoughtful responses. This entry was posted in Uncategorized on March 24, 2018 by Lynn Domina.